This Nativity is carved from bamboo by Ari Samuel in the village of Pucang Sawit in central Java, Indonesia. The income helps support Ari’s family. Despite the unique hardness and roundness of bamboo reeds, the figures are surprisingly detailed. 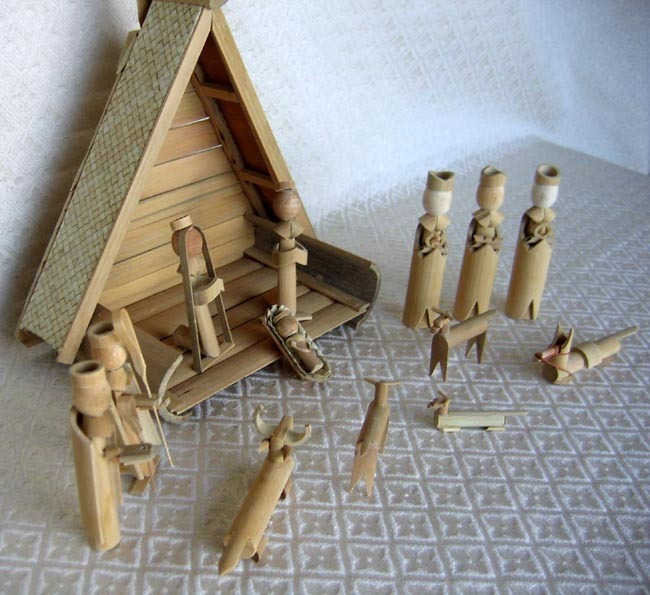 The fifteen pieces in this set include a unique bamboo stable with woven wicker sides, a bold star with five points, the Holy Family, three wise men with gifts, two shepherds with curved staffs, a cow, a donkey, and three sheep. Baby Jesus sleeps in a wicker manger. The stable measures 11 inches tall (including star) by 8.5 inches wide by 4.5 inches deep. The standing wise men measure 4 inches tall. Each figure comes wrapped in handmade Indonesian paper.